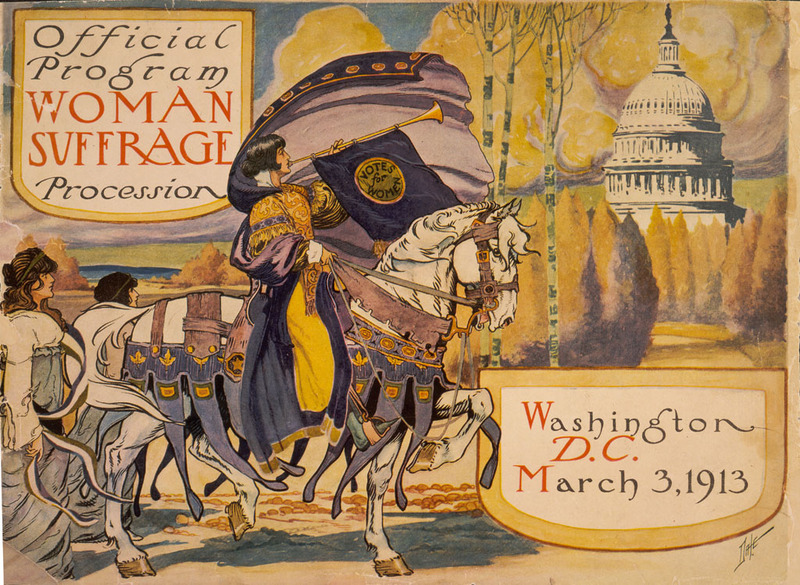 Today’s block is in remembrance of the March 3, 1913 women’s suffrage parade in Washington, DC. The event was organized by the suffragist team of Alice Paul and Lucy Burns (no, I did not say Burns and Allen), who secured endorsement from the National American Woman Suffrage Association (NAWSA), but were required to raise funds to support the project elsewhere. In short, they hoped to draw attention to the fact that it was time for a federal amendment supporting the right of women to vote. Illustration from New York Evening Journal. New York, NY: Star Co., March 4,1913 p. 2, col. 4. It was to be a gala turnout and a peaceful one, led by Inez Millholland, a labor lawyer. The parade was comprised of nine bands, more than twenty floats, four mounted brigades, and 5,000 suffrage delegates from around the world. The parade was to begin on Pennsylvania Avenue, and events were planned to cap the event – a pageant at the Treasury Building, and Helen Keller was to speak at Constitution Hall (yes, I did say speak). Illustration by Dale for the National American Woman Suffrage Association. 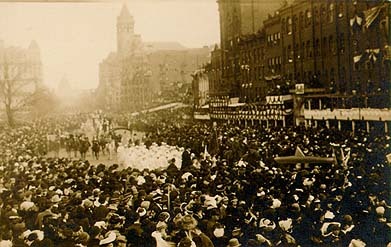 NAWSA parade, March 3, 1913. Photo courtesy Library of Congress. 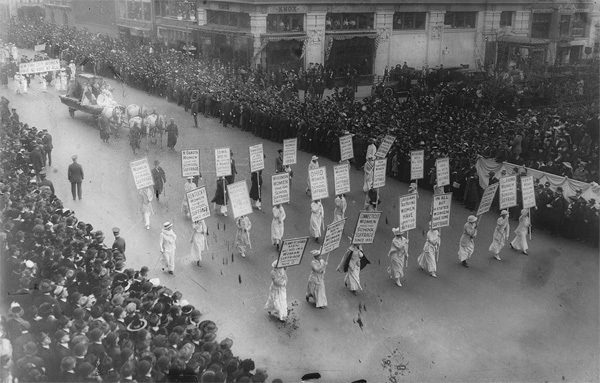 NAWSA parade, Washington, DC, March 3, 1913. Photo courtesy of Library of Congress. Much as I’d like to take a sharp left turn to a more pleasantly nostalgic subject – note the reference to an old radio program – I won’t. Like a lot of people, I tend to view the past through rose-colored glasses. Simpler times, right? Apparently the mere thought of five thousand women with a mission struck fear in the hearts of American men. After traveling just a few city blocks, the marchers found themselves blocked by an assemblage, most in town to attend the inauguration. The men were not hampered by the local police; on the contrary, they were often abetted by Washington’s Finest who happily joined the festivities by heckling and harassing the marchers. The crowd blocks forward progress of the NAWSA parade. Photo courtesy of Library of Congress. The parade continued, the marchers often having to pass single file through the crowd of men until things got out of hand. The marchers were physically assaulted, and according to reports, it took two ambulances six hours to locate and remove one hundred injured marchers. 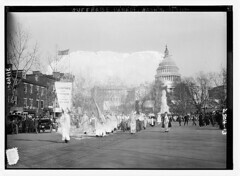 Red Cross Ambulance, NAWSA parade in Washington, DC, March 3, 1913. Photo courtesy of Library of Congress. Secretary of War Henry L. Stimson responded to a belated request from the chief of police – Stimson authorized the use of a troop of cavalry from nearby Fort Myer to help control the crowd. Ahem – take one more look at the photos – seriously, just a troop? That’s what, 120 mounted men or thereabouts? Newspapers the next day were outraged by the humiliation and injury suffered by the marchers – just so much fuel for the fire being fanned by Alice Paul. It seems to me that Alice learned her lessons well during the time she spent in England with those militant suffragettes – a workable formula – passive resistance, met with predictable violence, drawing syndicated newspaper attention to further engage the moral outrage of the average citizen. A heartfelt thank you goes out to Barbara Brackman, who manages to spark my curiosity and fire my imagination every single week. This entry was posted in Grandmother's Choice and tagged Alice Paul, politics, quilting, suffrage on October 27, 2012 by Jo. I really enjoy fussy cutting, but I may have pushed the envelope a little far today – the pattern was too irregular for cutting five repeated segments. A couple of the motifs turned out well, others have a squashed look. The points aren’t exactly sharp and it does wobble a bit, but lucky for me, little flaws like these will quilt out. No matter how long you’ve been quilting, it continues to be a learning process – and I’m happy enough with the block that I won’t cry “do-over”. Today, Barbara Brackman reintroduced me to Alice Paul (b. January 11, 1885 – d. July 9, 1977). Intrigued, I started exploring further and discovered that Alice Paul was an extremely well educated woman: a BA in Biology at Swarthmore College, an MA in Sociology and a PhD in Economics from the University of Pennsylvania – not stopping there, she earned an LLB from the Washington College of Law at the American University, Washington, DC – zowie! Alice Paul got her chops in activism working alongside Emmeline Pankhurst and other women that caused controversy up, down, and across England, using militant tactics to further awareness of the suffrage movement and secure the vote for women. Oh yeah, we’re talking seriously dedicated suffragettes here. Returning to the US, Paul joined the National American Woman Suffrage Association, but when her tactics started to create tension among the leaders, she and that organization parted ways. With the help of a few of her colleagues and funding from Alva Belmont – a multi-millionaire and socialite – the National Women’s Party was formed. Mr. President How Long Must Women Wait for Liberty? The NWP began an active campaign of non-violent protest, and on January 10, 1917 they moved the action to the White House. Alice Paul and a dozen other protesters simply held banners stating their demand to the right to vote – these women became known as Silent Sentinels. The picketing lasted until June 4, 1919 when a joint resolution of Congress passed the 19th Amendment. They picketed for two and a half years. In all weather. All day. All night. Every day except for Sunday. During that time Alice Paul and other Silent Sentinels were assaulted, arrested, convicted and imprisoned at the Occoquan Workhouse in Virginia. Alice Paul was sentenced to seven months, and for two weeks she was held in solitary confinement on a diet of bread and water. When too weak to walk, she was removed to the prison hospital where she began a hunger strike. Others joined her. By her refusal to eat, and afraid she might die, doctors prescribed a program of mandatory feedings – three times a day for three weeks a tube was forced down her throat. I suppose a diet of raw eggs and milk would keep a person alive. Meanwhile, back at the ranch… the assault on the Silent Sentinels continued inside the Occoquan Workhouse. Guards brutalized the women – they were dragged, beaten, kicked and choked. Newspapers began to report the treatment of the protesters which helped to create more support for the suffrage movement. Wasn’t this an ugly piece of American history that we were never taught in school? Alice Paul survived imprisonment – she served her sentence, and on release resumed the fight for women’s rights. Alice Paul celebrating the ratification of the 19th Amendment – August 18, 1920. This entry was posted in Grandmother's Choice and tagged Alice Paul, Appliqué, politics, quilting, suffrage on October 13, 2012 by Jo.